There are two women that I credit for my love of cooking, my comfort in the kitchen, and most importantly, my love of food. My mother is an amazing culinary presence, and I never cease to be impressed by her determination to make things from scratch and from whole, fresh ingredients. She is a natural born cook, and she taught me both how to work in the kitchen and how to eat. In fact her mantra “variety is the spice of life” is something I hated as a child (mainly when she was making me eat escarole) but now looking forward to saying to my own children. I remember having friends that wouldn’t eat anything but peanut butter and jelly and chicken nuggets, and as an adult I really appreciate how rarely we ate fast food and the broad range of food she introduced us to. For Mother’s Day, which is coming up on May 10, I am going to share the favorite recipes of all the mothers and grandmothers in my life, beginning today with my mother, Cathy. Although my mother was raised cooking primarily Italian, she now lives in North Carolina and cooks a broad range of foods, everything from bacon wraps to lemon pistachio cake. She’s also recently started a small catering company on the side, Top Nosh Catering, which is slowly but surely building a reputation around the Triangle. 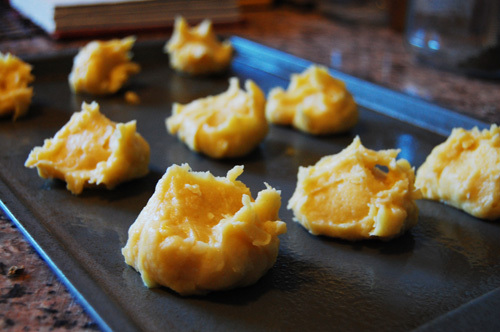 These cream puffs, or as my mother calls them, “dream puffs” are her great Aunt Jessie’s recipe. And they really are dreamy. The first real memory I have of cream puffs are from a family reunion at my Aunt Paula’s house in Sea Girt, New Jersey. I’m not sure who made them or brought them, I just remember eating them. So many of them. They are the perfect combination of flavors and textures. They are crunchy and smooth and sweet and like little morsels of heaven in each bite. The recipe is adaptable so that you can make these chocolate or vanilla. I like both, but I have to admit the appeal of chocolate is hard to resist. Another variation option is to fill them with vanilla pudding and then drizzle melted chocolate on the top. 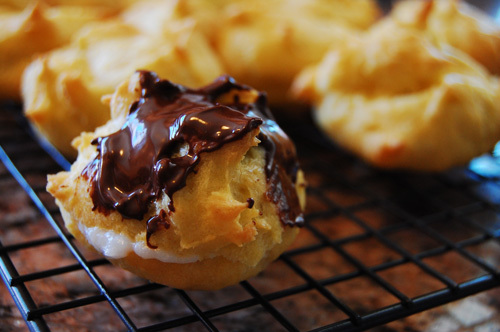 Whatever you do, serve these within a few hours of making them, as the pudding can make the rest of the cream puff soggy. And that’s not the desired effect. My mother also thinks it’s very important that I tell you that if you wanted to, you could use the puff with savory ingredients, like tuna salad. Scald 2 1/2 cups of milk. Mix cornstarch, sugar, and salt. Add that to the scalded milk, as well as the remaining milk. Over low heat, cook until thick. 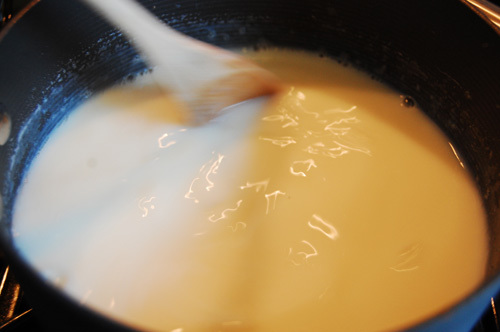 If your pudding isn’t thickening, try adding more cornstarch, 1/2 tsp at a time. Once thick, cook an additional five minutes. Allow to cool slightly and stir in the vanilla extract and butter. 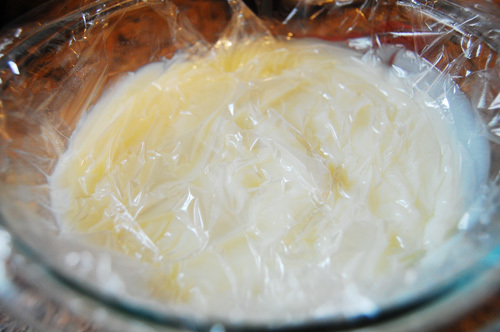 Pour into a medium size bowl, and place plastic wrap directly on the top of the pudding. This will prevent it from getting that gross skin as it cools. Allow to cool completely, which takes at least a few hours. It may be easier to make the pudding the night before and make the puffs within a few hours of serving them. Right before you’re ready to stuff the puffs, whip the cream until it can hold soft peaks. Add in the sugar and vanilla and whip an extra two minutes. Gently fold the whipped cream into the pudding to create an airy filling. Bring water to boil in a medium size pot. Stir in butter, and allow it to melt and return to a boil. Stir in flour and remove from heat. 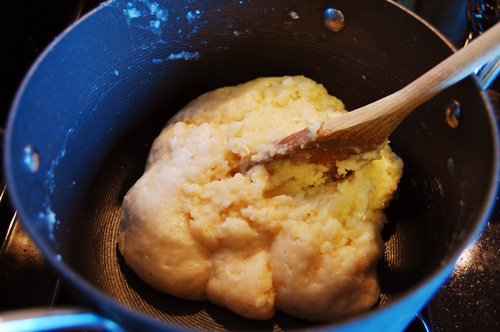 Continue to mix until the flour has formed a nice ball, and is separated from the edges. Allow to cool slightly. Add in one egg at a time. After each egg, stir until the egg is completely incorporated and no longer sticking to everything. Use a spoon to drop onto a greased baking sheet. Make sure that there is a peak on each one of your batter balls. Bake for 10 minutes at 400, and an additional 20 at 350. As they’re baking, melt chocolate in a double boiler. Allow to cool for 20 minutes to an hour. When they’ve cooled, use a serated knife to open them slightly, enough to spoon/pastry bag filling into them. Fill each puff with 1-2 tbsp pudding/cream. When they’re filled, drizzle melted chocolate on top, and allow the chocolate to harden.